One of such treatment processes like solar irradiation is designed, to be implemented in rural areas where people have minimal access to clean water. Solar irradiation can remove a wide range of organic chemical and pathogenic organisms by direct exposure. A big advantage of using this treatment is the absence of harmful by-products at the end. This treatment is based on two important factors, light and heat. The most effective wavelength for microbial destruction is the near -UV-A band (320 to 400 nm) and to a lesser extent the visible band of violet and blue light, 400 to 490 nm, according to a paper published in the Applied and Environmental Microbiology Journal. Other Conventional technologies like chlorination, ozonation, and artificial UV radiation are also applied to treat water for residential use. However, they are more capital intensive and require sophisticated equipment and skilled operators. 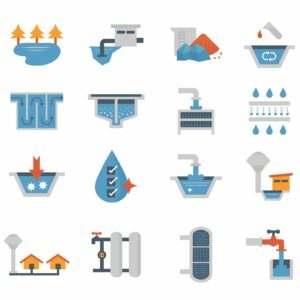 In the commercial sector, the water treatment technologies consist of multiple stages and more sophisticated design to treat a wide variety of contaminants. Recently, a membrane-based packing media was discovered by NSF to treat the produced water from oil and gas. The treatment of produced water is challenging as it usually contains a high quantity of dissolved salts, scaling compounds, silica, and variety of organic compounds. In this direct-contact membrane distillation technology, the temperature difference is the driving force which forces water vapor to pass through the fine pores of a membrane. Water is collected as cold distillate on the other side of the membrane. Water treatment methods need to be carefully selected and designed to be cost-efficient and quality controlled. Recently, SEDRON TECHNOLOGIES (JANICKI BIOENERGY) developed a new and impressive technology called the Janicki Omni Processor. It is an integrated system that processes waste to produce clean water and burns dry fuel to produce electricity which is further used to power the Omni Processor. The exhaust from the burner and the wastewater are treated to meet the stringent environmental regulations. Another commonly employed water treatment method is Steam Stripping/ Air Stripping in a packed bed. This involves the transfer of Volatile Organic Compounds from the liquid to the Gas Stream. The vapor stream is further treated to comply with the regulations of the Clean Air Act. The type of packing whether structured or random, is selected based on the temperature, the chemical properties of the contaminant and the required pressure drop. Among many types of random packing, Tri-Pack is the most commonly referred packing by MACH Engineering as it confers low-pressure drop and its spherical shape helps achieve high mass transfer and heat transfer rates. Clean drinking water is something we take for granted in U.S. Maintaining water quality is a crucial task because a little setback can lead to serious issues or even public health crisis. However, there are many developing countries who fail to investigate water quality at each step before it gets reached to the consumer and thus face severe consequences.